This value indicates maximum Profile Acceleration(108). Profile Acceleration(108) can’t be configured with any values exceeding Acceleration Limit(40). Profile Acceleration(108) is used in all operating mode except PWM Control Mode in order to generate a target trajectory. For more details, please refer to the Profile Velocity(112). These values limit maximum and minimum target positions for Position Control Mode(Joint Mode) within the range of 1 rotation(0~4095). Therefore, Goal Position(116) should be configured within the position limit range. 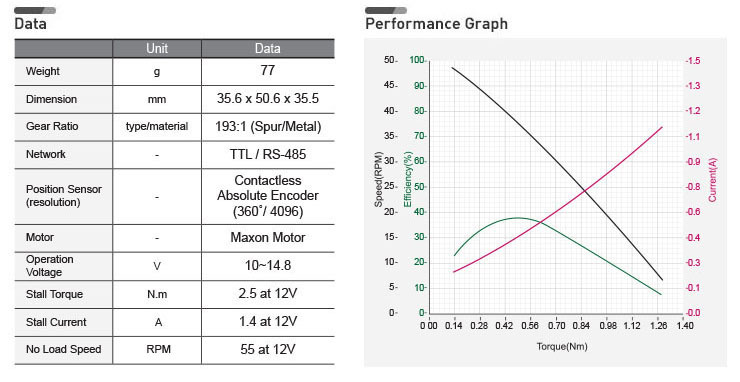 These values are not used in Extended Position Control Mode. For more details about the PID controller and Feedforward controller, please refer to the below websites. If the Bus Watchdog Error screen appears, the Goal Value (Goal PWM(100), Goal Velocity(104), Goal Position(116)) will be changed to read-only-access. The acceleration of Profile can be set with this value. Profile Acceleration(108) can be used in all control modes except PWM Control Mode. Profile Acceleration(108) cannot exceed Acceleration Limit(40). For more details, please refer to the Profile Velocity(112). The Maximum velocity of Profile can be set with this value. 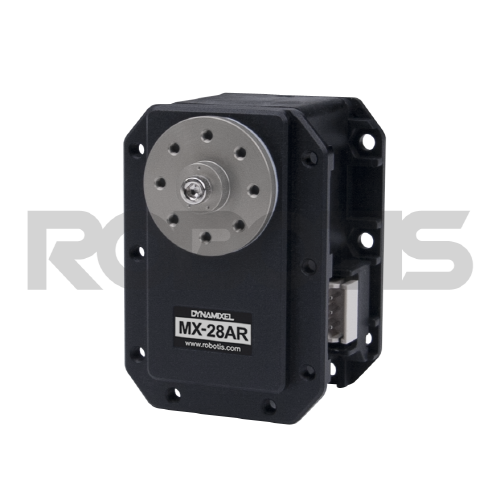 Profile Velocity(112) can be used in all control modes except PWM Control Mode and Velocity Control Mode. Profile Velocity(112) cannot exceed Velocity Limit(44). Velocity Control Mode only uses Profile Acceleration(108) instead of Profile Velocity(112). When given Goal Position(116), Dynamixel's profile creates target velocity trajectory based on current velocity(initial velocity of the Profile). When Dynamixel receives updated target position from a new Goal Position(116) while it is moving toward the previous Goal Position(116), velocity smoothly varies for the new target velocity trajectory. 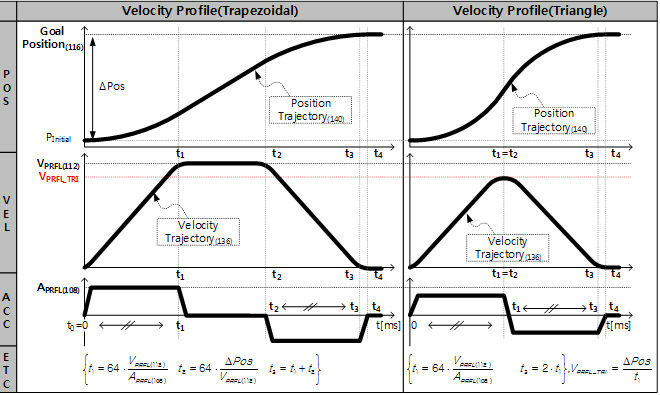 Maintaining velocity continuity while updating target velocity trajectory is called Velocity Override. For a simple calculation, let's assume that the initial velocity of the Profile is '0'. 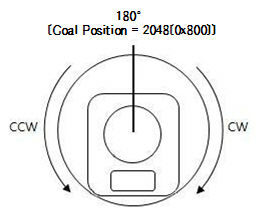 The following explains how Profile processes Goal Position(116) instruction in Position Control mode, Extended Position Control Mode. ② Position Control Mode, Extended Position Control Mode : Velocity Trajectory is used to create Position Trajectory(140). When Profile reaches to endpoint, Velocity Trajectory(136) is cleared to '0'.